I set a table for the traditional St. Patrick's day. A fun and whimsical table with this cute Leprehaun I found at Pier1. Luckily it was on sale, since the holiday is so close. 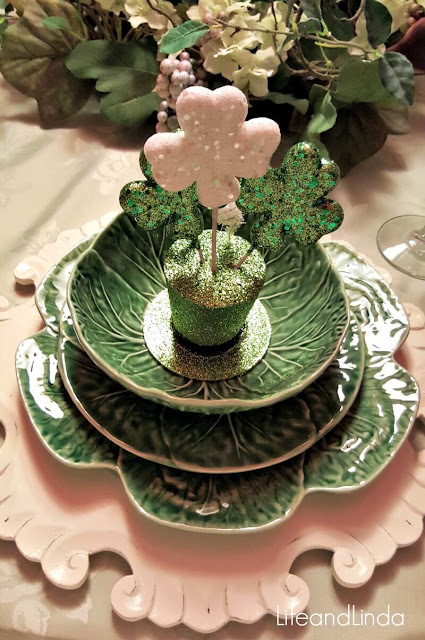 I am sharing this post at Kathleens 8th Annual St. Patrick’s Day Blog Crawl! Cute little shamrocks sit in the cabbage bowls. They are tucked into a tiny green hat. Have to have shamrocks too. The fun napkins sits in a green goblet. Isn't he cute? He looks like he is having fun! Cabbage plates and bowls sit on my white chargers from Pier1. Green flatware blends in nicely with this theme. Those pillow cases come in handy for covering our chairs. I added green sashes to each chair. Again, this is our Breakfast room, our former dining room. I am thinking about covering those chairs and buying new curtains for a new look! I am going to cook the traditional corned beef and cabbage with potatoes and carrots. 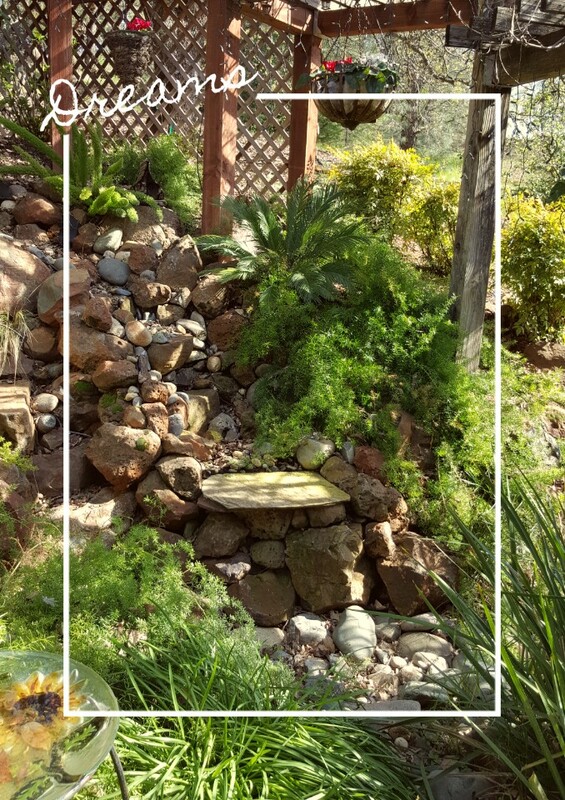 I thought I would share a photo of our waterfall again. Everything looks so lush and green. We have had lots of rain, so we are so appreciative of that. It will be warm before we know it. I love your table setting. Your dishes are gorgeous, the silverware and napkins also. Happy St. Pats Day. Linda, youre tables are always soooo beautiful! 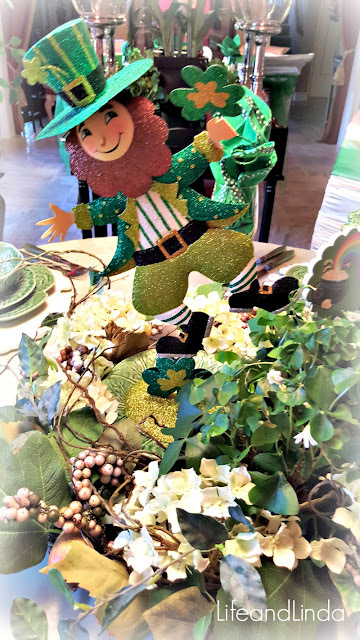 I adore those white chargers from Pier1, as they look so pretty with all the shades of green & your darling Leprechaun! I need to start decorating the white chairs in my dining room like you do. That is such a nice, special touch. Happy St. Patrick's Day...see you at the party later tonight!! So cute and I love the Leprechaun! I do like those pillow cases and the green sashes added the perfect touch! Wishing you a Happy St. Patrick's Day! Yes, I do love the table...all those cabbage dishes, who wouldn't! Cute leprechaun. 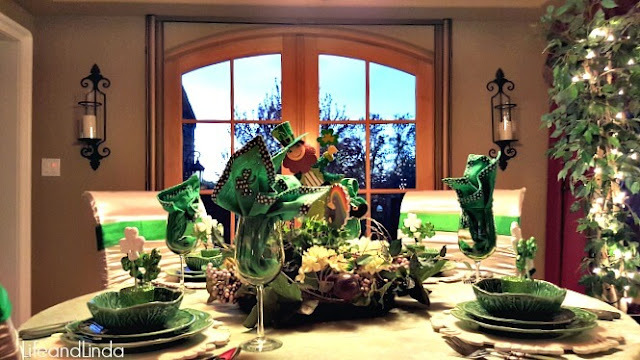 That is a gorgeous St Patrick's Day table, Linda! It's so cute and adorable! March 17th is my son's birthday. He was born three months premature 36 years ago - the luck of the Irish and more was surely with us. Love the table! It looks great! 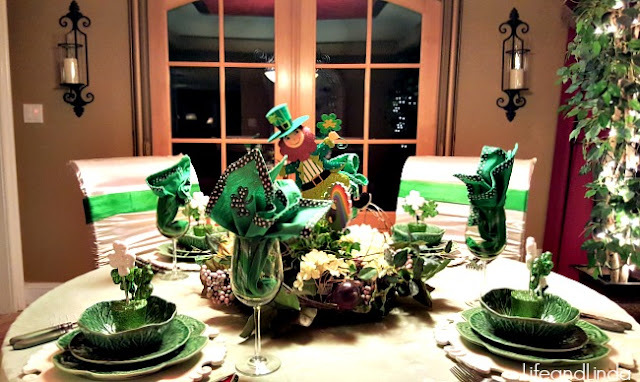 I'm sure that table will bring the Luck o' the Irish to whoever sits at it. I really like those white charger plates. 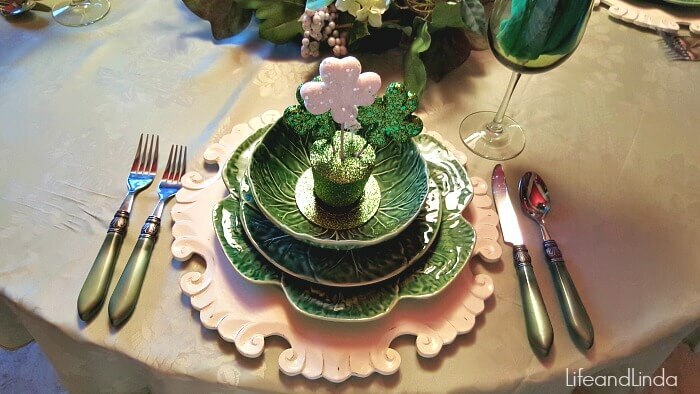 Great looking St.Patrick's table. Lucky you to find such a cute leprechaun for your centerpiece. 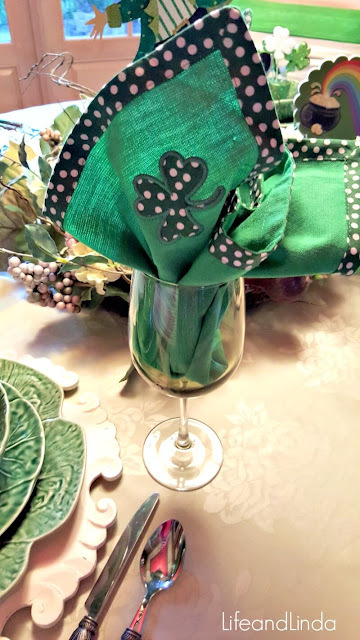 I love the shamrock napkins too. Only you could come up with shamrock graphics bordering your pics. So cute. Amazing and magical. 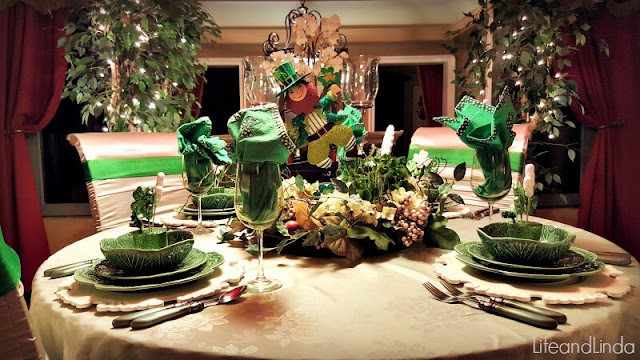 Love your centerpiece Leprechaun, he is so cute. Those napkins are perfect for St. Pat's Day. And... those little hats are so cute! Your waterfall is lovely and peaceful, so perfect to include a photo with this post! Looks like the fairies and naughty elves are hiding. Happy St. Patrick's Day. Linda I love your table. Very pretty. Your table is so pretty and I'm in love with your little leprechaun. I'm visiting from the crawl, happy st. Patrick's Day! Hi Linda! Yes, the leprechaun is very cute and he looks so mischievous too, but in such a nice handsomely kind of way. LOL! Your setting is wonderful. I love your napkins and the Bordallo plates. They are so pretty! Your whole tablescape is so lively and fun! I am joining you from the blog crawl as well. I hope you have a happy St. Patricks day tomorrow! Terrific centerpiece - always good to wait till last minute sales at Pier 1 :) I'm sure wishing I had some of the lovely cabbage plates that I'm seeing so much of on this blog crawl! I like how you've put the shamrock picks in the bowls. Happy St Pat's Day to you! Linda, your table is full of Irish charm. I know you are going to celebrate in style! Your cabbage plate stack is wonderful. All of my green plates are packed and in storage, so my post is a bit different this time. Still celebrating St. Patrick's Day! '-) Have a happy one! Hi Linda, love, love the cabbage bowls so adorable. Beautiful tablescape. 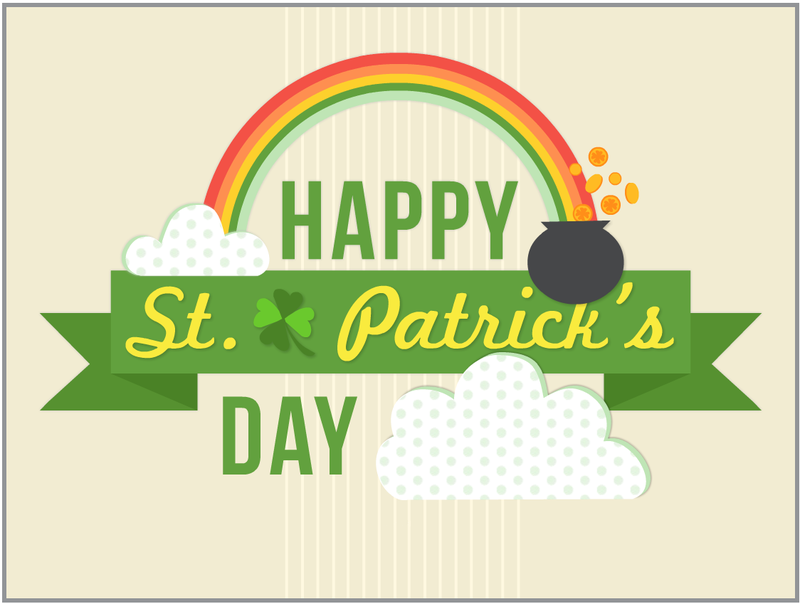 Visiting from Cathleen's blog crawl; I hope you have a great St. Patrick's Day, Linda, and a good weekend too! Hello Linda! I really like those napkins! You've set a fun table for St. Patrick's day! Love the blessing at the end of the post! Thanks for your visit!! Your dinner parties must be so fun! OMG this table is stunning!!! Happy St. Patrick's Day. Looks fresh and green. Good morning Linda! Next to aqua, emerald green is my favorite color. What a pretty display you have here and the BEST OF LUCK and love to you Linda! Oh, dear Linda, you are the bomb when it comes to setting a most spectacular table! This is just amazing and so cute! I have nothing for St. Paddy Day! Shame on me. You've changed your blog dress and it looks so nice. Thanks for popping in to see me. Beautiful table! 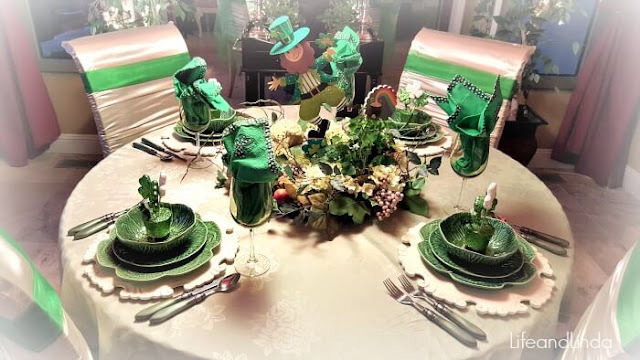 You are so creative with all of the green touches, including the sashes on the chairs. Happy St. Patrick's Day! Pretty, pretty, pretty Linda. I'm so in love with the tablescapes you girls do. So happy to have you at Thoughts of Home on Thursday. Hello Linda! Thanks so much for joining in the Blog Crawl with that fun table! I just love those napkins! Happy Easter too! Sorry I missed this the other day, it's adorable and I love love the pillow case trick! !